Apple iPhone: fake or slipped out in France? It's over again, this time from France. Apple's eagerly anticipated 'iPhone' may have made an unscheduled appearance in public this week - on the front page of a Paris newspaper. 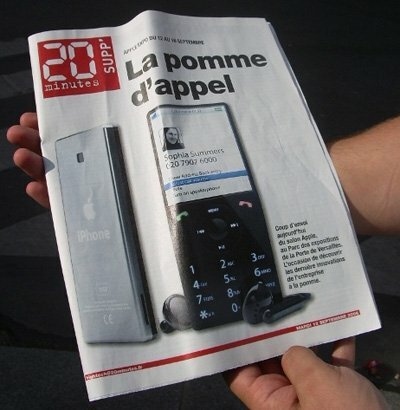 French publication 20 Minutes on Tuesday splashed a picture of the device on an edition of the paper timed to coincide with the opening of Apple Expo Paris. Even less than a rumor? Check the original french page.